FIIs were net buyers of equity on Fri. (Jan 25) but net sellers on the first four trading days. Their total net selling was worth Rs 5.6 Billion. DIIs were net sellers of equity on Tue. and Fri., but net buyers during Mon., Wed. and Thu. (Jan 21, 23 and 24). Their total net buying was worth Rs 12.6 Billion, as per provisional figures. India Inc’s profit-to-GDP ratio (for Nifty 500 index companies) dropped to a 15 years low of 2.8% in FY ’18 from 5.5% in FY ’08, as per a study by Motilal Oswal. For all companies (including unlisted ones), profit-to-GDP ratio declined from 7.8% to 3% in the same period. India’s exports to China increased from US $6.37 Billion during Jun-Nov ’17 to US $8.46 Billion during Jun-Nov ’18 – benefitting from the ongoing tariff war between USA and China. 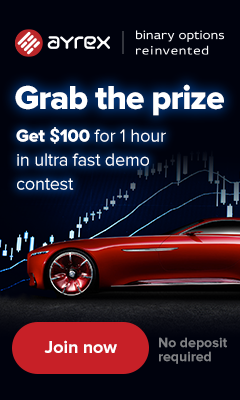 After making a smart start to the week by touching a high of 36701 intra-day on Mon. Jan 21 and closing at the highest level in 3 months, the index dropped below its 20 day EMA by the end of the week – losing 1% on a weekly closing basis. 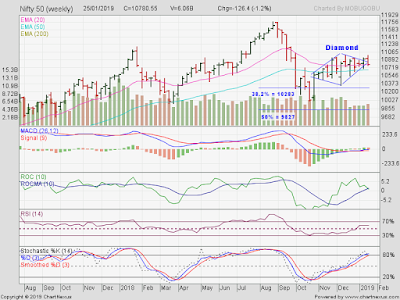 The upward breakout from the ‘diamond’ pattern had lacked volume confirmation, and has turned into a false breakout. Sensex closed more than 500 points above its 200 day EMA in bull territory. It has been trading above its long-term moving average for the past 4 weeks. However, caution is advised for those holding long positions. Any fall below the 200 day EMA can lead to a deeper correction, and a likely test of its Oct ’18 low of 33292. Expect bulls to put up a fight to defend the long-term moving average. Daily technical indicators are looking neutral to bearish. MACD has slipped below its signal line in bullish zone. ROC has dropped below its 10 day MA in neutral zone. RSI is falling towards its 50% level. Slow stochastic has fallen below its 50% level. Some more correction seems likely. F&O expiry on Jan 31 and interim budget on Feb 1 are important events next week. The ED and CBI appear to have suddenly gone on nationwide overdrive. That may crush bullish hopes of an already jittery market. A lot will depend on FIIs. They turned net buyers on Fri. Jan 25, and can help to prop up the market. Bears acted as expected. The index formed a weekly ‘reversal’ bar (higher high, lower close) and dropped to seek support from its 20 week EMA – losing almost 1.2% on a weekly closing basis. Nifty closed above its 50 week and 200 week EMAs in a long-term bull market. However, a correction towards the Fibonacci support zone between 10283 and 9827 remains a possibility. Weekly technical indicators are looking bullish to neutral. MACD is moving sideways above its signal line in neutral zone. ROC has formed a ‘head-and-shoulders’ reversal pattern and crossed below its 10 week MA in neutral zone. 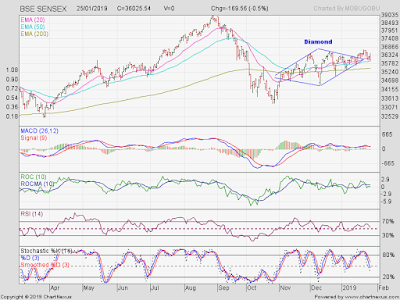 RSI is moving sideways above its 50% level. Slow stochastic has entered its overbought zone after four months. After touching a high of 26.54 on Tue. Jan 22, Nifty’s TTM P/E has moved down to 26.14, but remains well above its long-term average in overbought zone. The breadth indicator NSE TRIN (not shown) is moving down in neutral zone. Some correction or consolidation is possible. Bottomline? Sensex and Nifty charts had broken out above ‘diamond’ patterns, but the breakouts have turned out to be false ones. Both indices are trading above their long-term moving averages in bull territories. Corrective down moves from Aug ’18 tops can restart at any time. FII buying may help prevent such an occurrence.